KGI Securities analyst Ming-Chi Kuo today shared additional details about the rumored 6.1-inch iPhone that he expects to launch in the second half of 2018. Note: KGI's image has a slight error. iPhone 8 Plus has 3GB of RAM. We already know the device is said to have some iPhone X features, including Face ID, but with some design compromises to achieve a cheaper price point. That will include an LCD screen, as known, and now Kuo says the device will have an aluminum frame, single-lens rear camera, and no 3D Touch. It's unclear if the back of the iPhone will also be forged from aluminum rather than glass, a tradeoff that would inhibit wireless charging. In a research note obtained by MacRumors on Tuesday, Kuo added that the 6.1-inch iPhone also won't adopt the iPhone X's stacked logic board and L-shaped battery pack. Instead, he said the device will have a standard non-stacked logic board and rectangular battery pack like the iPhone 8 and iPhone 8 Plus. Kuo believes the 6.1-inch iPhone will be a mid-range device priced between $700 and $800 in the United States, up from his previous $650 to $750 estimate. The device is expected to be announced around September-October as usual alongside a new 5.8-inch iPhone X and a larger 6.5-inch version dubbed iPhone X Plus. 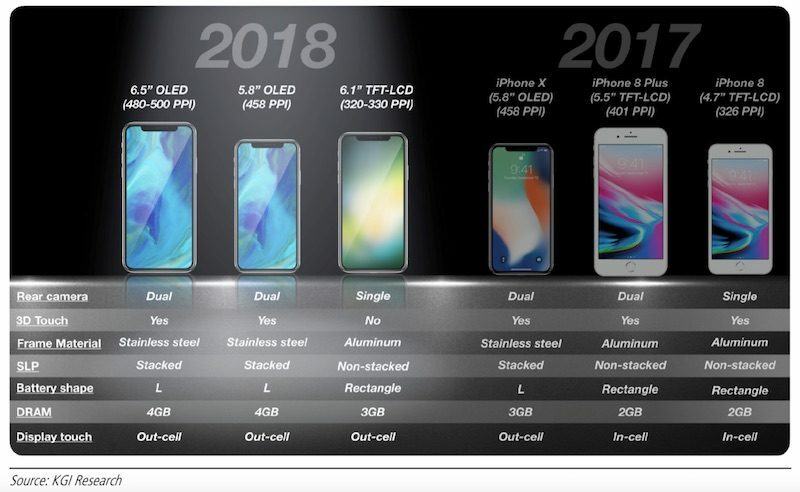 Development schedule of new 6.1" LCD iPhone slightly behind 6.5" and 5.8" OLED models, but it may enjoy extended longevity into 1H19F, boosting slow season outlook: We predict the 6.1" LCD iPhone will differ from the 6.5" and 5.8" OLED models in terms of certain specs, for reasons of cost/price and product segmentation. However, this shouldn’t have any effect on key user experience. We revise up our price projection for the 6.1" model from $650-$750 to $700-$800, and remain positive on shipments momentum. KGI Securities expects the 6.1-inch iPhone to account for around 50 percent of the new iPhone lineup's shipments, with sales remaining strong into 2019. It seems odd that they would not include 3D touch. That tech is a few years old at this point; it should become standard on all new iPhones at this point, especially since many recent UI enhancements in iOS depend on it. I think Apple is hurting themselves with these partial rollouts of their features. 3D Touch is already haphazardly implemented across their product lines. What incentive do developers have to implement 3D Touch when a) half their users can’t use it and b) because anyone doesn’t have it, any function achieved with 3D Touch needs to also be available without it, probably in a more easily discoverable manner. I always assumed that 3D Touch was taking a while to reach iPads because the current gen Pencil tech was incompatible, but if this rumor is to be believed and it really is Apple’s intention to only include 3D Touch in their highest end iPhones, I don’t think it’s worth it anywhere. BS. Why would they leave 3D Touch out when they have gone to lengths to integrate it as a core functionality? Mid-range? $700-800 is flagship pricing. LOL apple is such a penny pinching company now that creates unnecessary social hierarchy. What baffles me the most is the lack of an OLED display. Every phone that I know of in the $700-800 price range has an OLED display, and HAS HAD one for a while. As you know, Apple was late to the game adopting OLED screens. And now Apple is really going to limit the OLED display to their $1000+ phones? If so -- laughable. But we'll see. It's just a rumor. KGI has no clue about the 2018 iPhones. Why would Apple take out something it spent so much time developing software for? If Apple releases a gimped entry model, I’ll go elsewhere. Rather deal with Google’s Pixel or the Galaxy because I know I’ll get more hardware for my $.